A Pacific Epic, by Thomas Osborne. Some names come laden with epic baggage. The Golden Gate is one of them. Fast forward to 2015. San Francisco no longer dominates Pacific trade, and other ports along the West Coast have been preparing for a new and enlarged Panama Canal, which will make for uncertain waters in transpacific trading. If the near future of California’s involvement in the Pacific world seems unclear, the prospects for the Golden State’s ocean commerce in 2115 are as fog-shrouded as a San Francisco summer. Whatever lies ahead, we know California’s future is deeply tied to the Pacific world beyond our shores. After all, California literally emerged from the Pacific, geologically speaking, and has been formed and reformed by Pacific migrations, commerce, military action, and culture. A look back at that history in this centenary year may help cut through the fog, allow us to better understand our present uncertainties, and, perhaps, see the outlines of 2115 and beyond. California’s Pacific history begins about thirty million years ago. In that distant past, the submarine Pacific Plate plunged beneath the North American Plate; parts of the Pacific Plate scraped off and piled up onto the West Coast, giving rise to the California land mass largely as it exists today. The Golden State was created by huge, shifting, and sometimes colliding forces beneath the Pacific. In this geological soup, gold made its way from the bottom of the ocean to the High Sierra’s mother lode. 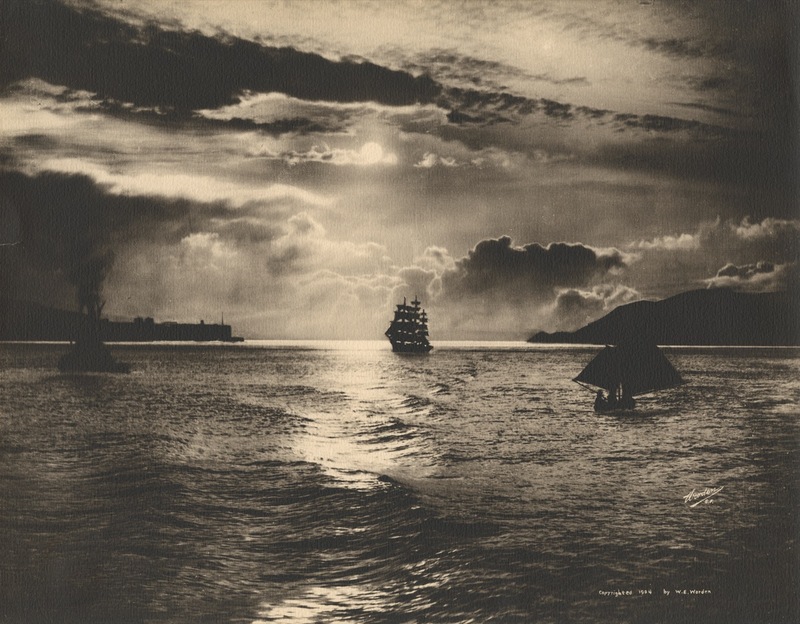 Willard E. Worden, Untitled ((Clipper Ship in the Golden Gate)), circa 1904. Courtesy Oakland Museum of California. More than a half-century before the Panama-Pacific exposition, on 12 May 1848, that gold started a boom. Merchant Sam Brannan waved a bottle of gold dust in San Francisco, shouting: “Gold! Gold! Gold! From the American River,” and so began the California Gold Rush. Argonauts came mainly by sea to try their luck in the goldfields.3 Tens of thousands hailed from homelands throughout the Pacific Basin—Mexico, Peru, Chile, Hawaii, Australia, New Zealand, China, and British Columbia. Some settled permanently, but not all did: Australians and New Zealanders left California in droves and recrossed the Pacific in the 1850s and 1860s, when gold was discovered back on their home islands. These Pacific crossings and recrossings tethered California, particularly the Bay Area, ever more tightly to the Pacific world by circulating people, capital, science, technology, industry, and culture. During the rush, California’s gold didn’t just buoy currency markets worldwide; it transformed other cities. For instance, the wealth that flooded into Hong Kong enabled it to become the major hub of Pacific trade that it is today.4 California’s Gold Rush was a Pacific world moment that catapulted San Francisco into the first rank of global port cities. California’s gold petered out around 1860, but San Francisco’s Pacific course was set. The city emerged as the world’s whaling capital by 1880, around the same time as Central Valley farming was starting to fill grain ships bound for far-off Pacific markets at the ports of Stockton and Sacramento. Shipment of grain, borax (a mineral used as a cleanser), quicksilver (a mercury amalgam used in mining), lumber, salt, dried seafood, and other products assured San Francisco’s maritime dominance on the west coast of North America—and beyond. San Francisco waterfront from the bay. Courtesy San Francisco Public Library. With the annexation of Puerto Rico, Hawaii, and the Philippines, American trading interests grasped the opportunity to establish a network of coaling stations and naval bases along a maritime route from the Atlantic seaboard to Asia, through a canal to be dug across the Isthmus of Panama.6 The Atlantic and Pacific approaches to a Central American canal could be defended from Hawaii on one side and the American-controlled Caribbean on the other, securing the long-hoped-for trade route to Asia. 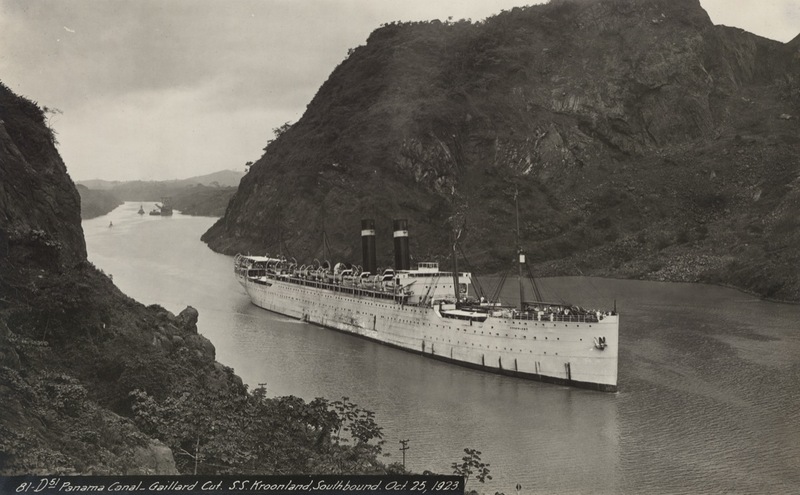 By the early 1900s, an imperial San Francisco began to see its fortunes linked to the grand canal that was being built through Panama’s steaming jungles.7 In hindsight, by 1903, when the United States acquired sovereignty over a swath of Panamanian territory between the Caribbean and the Pacific, a canal-themed international exposition in San Francisco a dozen years later seems as good as inevitable. To make the San Francisco world’s fair a reality, planners and investors put in time and talent—and a lot of money. Prominent San Francisco business and civic leaders spent the decade before the fair planning and building. Forty-one nations participated—an amazing number considering that much of Europe was engulfed in World War I at the time.8 Pacific Basin-themed exhibits predominated, including life-size replicas of a Mexican pueblo, a Samoan village, and Chinese and Japanese settlements. A huge miniature replica of the Panama Canal occupied nearly five acres on the fairgrounds. During the 288 days that the exposition ran (20 February 1915 to 4 December 1915), more than eighteen million visitors saw these and other attractions, reportedly a record for world’s fairs at that time. Given the magnitude of the project—which included beating out New Orleans, San Diego, and other cities for congressional approval and funding—why did city leaders believe it necessary to host a world’s fair? The prospect of material gain was extremely important. The city’s movers and shakers wanted to herald San Francisco’s impressive recovery from the great earthquake and fires of 1906. But more than that, San Franciscans hoped the fair would allow the city to grab a lion’s share of new Pacific trade soon to be pouring out of the Panama Canal. The city’s Chamber of Commerce and Merchant Exchange were the prime movers in drafting and implementing the plan to host the global event. Reuben B. Hale, a prominent San Francisco department store owner and real estate developer, was the first to pitch the idea of holding a San Francisco world’s fair in connection with the opening of the Panama Canal. Speaking at the San Francisco Merchants Exchange on 12 January 1904, Hale shared his vision, which linked the city’s future to the opening of the Panama Canal and the expected growth in transpacific commerce: “We are at the center around which trade revolves between the United States and all European countries that are looking for trade with the Orient and other Pacific Ocean points.”9 Mayor James (“Sunny Jim”) Rolph, who co-owned a fleet of cargo vessels traversing the ocean from San Francisco to Hawaii and trading with other Pacific ports in South America and Australia, fully supported Hale’s idea. When the gates to the exposition grounds opened in 1915, Hale’s idea of San Francisco as the center of an American empire had caught on. While fairgoers were treated to spectacular displays of machinery, sculptures, and architecture featuring images that celebrated America’s new Pacific empire, a gathering of scholars called the Panama-Pacific Historical Congress was meeting in Berkeley, San Francisco, and Palo Alto to discuss the canal, California, and San Francisco. There, University of California professors H. Morse Stephens and Herbert E. Bolton proclaimed a new era in world history: “The Panama Canal must inevitably change the relations of the American, the Asiatic, and the Australasian countries bordering upon the Pacific Ocean toward each other. One era of Pacific Ocean history comes to an end; another begins.”10 Another scholar declared: “We see the canal finished before our eyes. The seat of empire begins to shift from the Atlantic to the Pacific.”11 Many informed Californians already agreed with this view of San Francisco as an emerging hub of commerce and civilization in the world’s largest ocean basin. “Panama Canal – Gaillard Cut. S.S. Kroonland, Southbound. (October 25, 1923)” drawn from the James Gordon Steese Papers. Courtesy Archives and Special Collections, Dickinson College. Frank Morton Todd, writing about the exposition at the time, explained that San Francisco was only ninety-six nautical miles off the shortest (Great Circle) route from Panama to Yokohama, Japan, making the city a natural port of call. This presented “an opportunity for expansion in every trade affecting shipping and in every line of activity dependent on cheap freights to and from the Orient and to and from the Gulf and Atlantic coasts. The Canal has given San Francisco a new position on the planet.”12 Thus with the opening of the Panama Canal, scholars and other notables attending the fair and related events around the Bay Area connected California’s past, present, and future with America’s ever-increasing advancement into the Pacific world. In the intervening century, some things have not changed. California’s coast is still a critical staging ground for the country’s commercial aspirations, and, once again, attention is fixed on the Panama Canal. Today, as a project to expand the Panama Canal reaches completion, California’s business and governmental interests seem less jubilant than they were in 1915—and more concerned than ever about getting the Golden State’s share of future Pacific Ocean trade. US military strategists, too, must reckon with the national security implications of the new canal. A container ship sails through the Golden Gate. Courtesy John Morgan. San Francisco’s hegemony over Pacific Coast trade was surpassed by other California port cities more than fifty years ago. Oakland, Los Angeles, and Long Beach now dominate American maritime trade, and together account for 70 percent of the nation’s trade with Asia. With port commerce continuing to grow—and with surfing, beach tourism, and fishing industries thrown in—the Golden State boasts the nation’s largest coastal economy.13 That said, Los Angeles-Long Beach port officials are deeply concerned about competition expected when the Panama Canal reopens in 2015 and other major West Coast ports vie for market share of transpacific trade. The Pacific ports are not the only worries; rivals on the Gulf and Atlantic coasts are expected to step up the competition, too. Time and money will determine which ports come out on top when the canal reopens. How long it takes and how much it costs to unload container ships and move their goods onto trucks and trains are critical factors now. So far, California’s ports and their Pacific Coast rivals are doing well on this front, compared to East Coast ports, according to Geraldine Knatz, the former executive director of the Port of Los Angeles. More than 90 percent of imports destined to inland markets in the United States move through West Coast ports.14 Preserving and augmenting this advantage is the chief challenge for California’s ports today. That the Panama Canal route to East Coast ports from Asia is one-third longer in distance than the transpacific track from Asia to the West Coast is good news for California. Cargo voyages from Asian ports through the Suez Canal to the East Coast are approximately twice the distance to the West Coast. Moreover, in anticipation of increased competition in maritime trade and climate-induced sea-rise, California’s leading ports and others on the West Coast have upgraded their facilities while working to reduce greenhouse gas emissions from in-harbor vessels, trucks, and on-dock equipment. The Los Angeles-Long Beach harbor complex and other West Coast ports share an added advantage over competitors, namely, that their carbon footprints are smaller in nearly all routing scenarios from Asia to inland markets in the United States. Scudder Smith, an adviser to the Panama Canal Authority, says that the threat of a reopened, enlarged Panama Canal to California shipping, though real, has been exaggerated. The greater challenge to Southern California’s twin ports, he and other experts believe, will come from other major ports on the West Coast, which are building or upgrading intermodal transit systems to whisk cargo from Asian vessels to interior markets in preparation for the opening of the enlarged Panama Canal in 2015.15 West Coast ports are striving not only to “beat the canal,” but even more so to beat each other for market share in the Pacific world. The impact of the reopened canal isn’t only commercial. The US Navy base at San Diego is the principal homeport of the Pacific Fleet, the world’s largest armada.16 In an echo of 1915, the United States military is once again engaged in a strategic “Pacific pivot.” In an article in the US Naval Institute’s journal, Proceedings, on the anticipated reopening of the Panama Canal, naval Commander Robert W. Selle noted: “We need a greater presence in the far Western and North Pacific areas, including the international waters of the strategically important Sea of Okhotsk, to counter Russia’s and China’s presence in the region.” A century after the Panama-Pacific International Exposition, the Golden State is still central to power struggles throughout the Pacific world. 2115: A New Pacific World? As a historian, I am reluctant to predict the future. But this much seems clear: patterns that we can discern today in 2015 will very likely shape the way California interacts with the wider Pacific world a century from now. Led by China, Pacific Asia—the world’s most economically robust region today—will likely dominate global manufacturing and maritime trade for the next century. With its abundant investment capital and lower production and labor costs, China’s ascendancy in Pacific trade is easy to imagine. By 2115, given current plans of Chinese investors, a canal might even be sliced through Nicaragua, to compete with the Panama Canal and enlarge the volume of potential trade between the Pacific and Atlantic worlds.17 If this canal were built, it could dramatically decrease traffic through California ports. On the other hand, assuming California’s world-leading computer, biomedical, and green economy sectors continue to pump out high-tech exports to Asia and elsewhere, it seems likely that these businesses will continue to play a strong role in transpacific trade. Given the fact that the Golden State has more Nobel laureates than any other state or nation,18 a disproportionate share of world-class researchers in the fields of science and technology, and more venture-capital investment dollars than all of the other states combined,19 this cautiously sanguine economic prospect for 2115 seems justified. Yet the global environment is a complicating and crucial factor in all of these scenarios. Global warming could sufficiently melt the Arctic icecap to open up a long-sought northwest passage between the Pacific and Atlantic.20 Central American canals may no longer be the best option for trade moving between these two oceans. The implications are difficult to gauge, but it is clear that climate change will cause trouble for ports along all of America’s coastlines, and not just because of rising seas. Amid such contingencies, what seems certain is that California’s perennial Pacific connections will continue to be crucial in 2115. This coastal state has a strong record of adapting to realities that require new thinking and innovation. California’s optimism and achievement, much ballyhooed at the Panama-Pacific International Exposition in 1915, have continued to draw some of the best minds—and boatloads of trade and venture capital— to the Golden State in the century since. If the past tells us anything about the future, California’s Pacific edge will enable us to thrive in 2115 and beyond. Rendering of the MAERSK Innovation Triple-E, the world’s largest container vessel. 1. The quotation is attributed to then US Army Captain John C. Frémont and is dated 1 July 1846. It appears online at http://goldengatebridge.org/research/Name.php. This website is managed by the Golden Gate Bridge Highway & Transportation District. 2. I use the term “Pacific world” as a synonym for the Pacific Basin, that is, the entire waterscape of ocean, islands, and bordering lands of Asia and the Americas. 3. James P. Delgado, To California by Sea: A Maritime History of the California Gold Rush (Columbia: University of South Carolina Press, 1990), ix-x; Aims McGuinness, Path of Empire: Panama and the California Gold Rush (Ithaca: Cornell University Press, 2008), 6. 4. Elizabeth Sinn, Pacific Crossing: California Gold, Chinese Migration, and the Making of Hong Kong (Hong Kong: Hong Kong University Press, 2013), 2, 297–299. 5. Sarah J. Moore, Empire on Display: San Francisco’s Panama-Pacific International Exposition of 1915 (Norman, OK: University of Oklahoma Press, 2013), 76. 6. Thomas J. Osborne, “Trade or War: America’s Annexation of Hawaii Reconsidered,” Pacific Historical Review 50: no. 3 (August 1981), 285–307. 7. Gray Brechin, Imperial San Francisco: Urban Power, Earthly Ruin (Berkeley: University of California Press, 1999), 246–247. 8. Moore, Empire on Display, 191. 9. Frank Morton Todd, The Story of the Exposition: Being the Official History of the International Celebration Held at San Francisco in 1915 to Commemorate the Discovery of the Pacific Ocean and the Construction of the Panama Canal, 5 vols. (New York: G.P. Putnam’s Sons, 1921), 1: 36–37. 10. H. Morse Stephens and Herbert E. Bolton, eds., The Pacific Ocean in History: Papers and Addresses Presented at the Panama-Pacific Historical Congress Held at San Francisco, Berkeley, and Palo Alto, July 19–23, 1915 (New York: The Macmillan Co., 1917). 12. Frank Morton Todd, The Story of the Exposition, supra, 1:31. 13. Judith Kildow and Charles S. Colgan, California’s Ocean Economy: Report to the Resources Agency, State of California, prepared by The National Ocean Economics Program (July 2005), 1, online at http://www.opc.ca.gov/webmaster/ftp/pdf/docs/Documents_Page/Reports/CA_Ocean_Econ_Report.pdf. 14. Geraldine Knatz, “The Expansion’s Market Impact,” Marine Technology (July 2011), 8–9. 16. See these two official US Navy websites: http://www.navyregionsouthwest.com/go/doc/4275/1173475/Naval-Base-San-Diego; http://www.cpf.navy.mil/about/facts/. 17. Los Angeles Times (9 September 2014). 18. The Stanford Report (5 September 2001). 19. See Time magazine cover story, “Why California Is Still the Nation’s Future,” (2 November 2009). 20. Ashutosh Jogalekar, “Climate Change Might Open Up Northwest Passage to Shipping by Middle of the Century,” Scientific American (6 March 2013), online at http://blogs.scientificamerican.com/the-curious-wavefunction/2013/03/06/climate-change-might-open-up-northwest-passage-to-shipping-by-the-middle-of-the-century/; Douglas R. Bradley, “Forging an Arctic Alliance: Canadian-U.S. JIATF-Arctic,” The Culture and Conflict Review, 5: no. 2 (Earth Day Special Issue). This is an official US Navy publication, online at http://www.nps.edu/Programs/CCS/WebJournal/Default.aspx?IssueID=30.